Largehearted Boy: Book Notes - Marcus O'Dair "Different Every Time: The Authorized Biography of Robert Wyatt"
Book Notes - Marcus O'Dair "Different Every Time: The Authorized Biography of Robert Wyatt"
Marcus O'Dair's Different Every Time is a fascinating biography of musician Robert Wyatt. "English music has produced some fascinating personalities, but few are as unusual as Robert Wyatt. This excellent book captures his gentle, generous and intelligent personality, and is incidentally a very good history of the music scene in England from the 1960’s onward." In 2015, a playlist seems an inevitable accompaniment to a book about a musician. 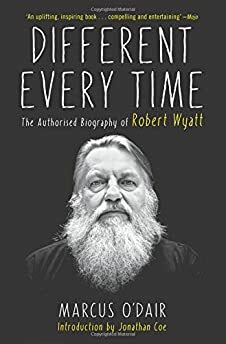 When that book is about Robert Wyatt, it should be easy enough to compile: especially in his guise as a solo artist, after and drumming and singing with Soft Machine and Matching Mole, Wyatt has a reputation long gaps between albums. In fact, if you include his guest appearances with Brian Eno, Syd Barrett, Björk, Hot Chip, Paul Weller and numerous others, the list of potential tracks is overwhelming – as we discovered when trying to select tracks for a compilation album to accompany Different Every Time. He's done everything from mainstream pop to avant-garde jazz, sometimes singing but at other times contributing percussion, or cornet, or trumpet, or keyboards. (Though he was a virtuoso player, Wyatt hasn't been able to play drum kit since he became paraplegic in 1973.) The list below, then, is only one of many possible lists; the one that happened to make sense on an early train to London one morning in October 2015. The tracks are listed in chronological order. The obvious track to include from Wyatt's days as what he calls a 'drummer biped' – i.e. before a fall from a fourth-storey put him in a wheelchair – is probably 'Moon In June', the 20-minute track he recorded almost entirely solo for Soft Machine's 1970 album Third. Yet Wyatt himself describes 'Signed Curtain', recorded a couple of years later with Matching Mole, as the moment he found his voice. Only three minutes long, simultaneously silly and sad, it makes for a fine point of entry into the Wyatt world. Those opening organ chords – played on an instrument that was close to a toy, bought in Venice while his future wife and creative partner Alfreda Benge worked on the film Don't Look Now – are as feeble and evocative as Wyatt's own signing voice. The song is a kind of love song to Benge, though one that says she's best when she's drunk, begs her to smile more in the mornings, and compares her to a mutant fish: 'partly fish, partly porpoise, partly baby sperm whale'. Barry White never did that. The opening track of Wyatt's most famous album, 1974's Rock Bottom, his first release after his accident, this is a cornerstone of Wyatt's oeuvre. Though he is often described as 'quintessentially English', Wyatt's musical identity is very much informed by African American music. Jazz is the influence that gets discussed most often, but soul and disco are important too; that the latter is sometimes dismissed by music snobs only adds to its appeal. Creative covers versions would become something of a Wyatt trademark: he's reinvented 'What A Wonderful World' and 'I'm A Believer', as well as lesser known tunes by Latin American protest singers such a Victor Jara. Here he tackles a number by Chic, perhaps the most musical disco group of all; rather than an anthem of emancipation, his version is hollow, lonely and forlorn. The track that brought Wyatt, one of the few musicians of his generation to survive punk unscathed, a new generation of fans. Like 'At Last I Am Free', he didn't write it – but Elvis Costello and Clive Langer wrote it with Wyatt in mind, and although Costello has recorded his own version, featuring Chet Baker no less, Wyatt's version remains definitive. About the Falklands War yet never referring to the conflict directly, the song ends up making a much bigger point about social class and the military-industrial complex – but without hitting anyone over the head with its didacticism. 'Shipbuilding' has been described as one of the best political songs ever written and it's hard to disagree. Björk – one of over 70 people I interviewed for the book – told me it was this recording that inspired her to ask Wyatt to contribute to her all-vocal 2004 album Medúlla. It was an unexpected choice: I think it only existed on a neglected vinyl until Domino re-released it on the Different Every Time compilation. The lyrics, by E. E. Cummings, reflect Wyatt's fondness for modernism; set to music by John Cage, they are a rare and glorious example of Wyatt's plaintive voice without accompaniment. Wyatt was a member of the Communist Party of Great Britain – the CPGB – for close to a decade. 'CP Jeebies', released in 1991, was his response to an internal split: it is, he says, a song about 'my despair at what turned into New Labour taking over the Left'. The recent election of the left-wing Jeremy Corbyn as Labour leader suggests that the victory of the more pragmatic New Labour might not have been as permanent as it once appeared – but Wyatt recorded 'CP Jeebies' while still politically heartbroken. Wyatt gets philosophical, pondering the limitations of free will, the lack of meaning in life and the desire for oblivion – lyrics written during a period of severe depression in the mid-1990s. Paul Weller plays guitar. The story of Robert Wyatt, at least from 1972, is really the story of Robert Wyatt and Alfreda Benge: wife, manager, lyricist, and the visual artist responsible for every front cover since Rock Bottom. 'Just As You Are', from 2007, is a Wyatt/Benge co-write – their attempt to write a country song, tackling head-on the deleterious effect of Wyatt's drinking on their relationship. (He has subsequently sobered up.) Unusually, it's a duet, with the bossa nova vocalist Monica Vasconcelos essentially representing Alfie.